Strain and serve pasta, veggies, and fresh fruits with this two-in-one dish. Strain and serve pasta, veggies, and fresh fruits with this two-in-one dish. Featuring a deep basin and top spout, this bowl allows you to drain hot pasta without setting it in the questionably clean bottom of the sink. 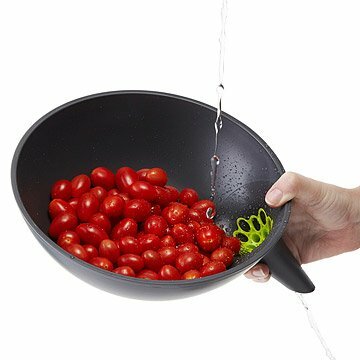 The spout can also be used as a handle, allowing you to securely eat and serve from the bowl once the pasta is drain and the fruit is cleaned. Black with green straining insert. Made in China. Ryann Aoukar is a Canadian product designer and interior architect. He was also associated with a global architecture firm before establishing his own practice in 2007. He has been teaching at the University of Tennessee since 2009. Aoukar holds a Bachelor’s degree in interior architecture and a Master’s degree in product design. I Love it so much!! I literally use it for everything! I love how the spout where water drains allows you to direct the water. However, the bowl could be slightly bigger. Draining 3 servings of pasta almost filled the bowl, so it isn't possible to dump a family sized amount of pasta all at once. You'd have to drain several servings, empty the bowl, then fill the bowl again. Since the drain hole is alittle small, it drains slower than most other strainers. Also, while the spout is a great idea, the spout can't be used as a handle when draining hot water. It is solidly made. I like that the bottom of the bowl is flat so you can sit it on the counter next to the sink; not have to put it IN the sink. If the bowl was bigger and had another handle on the opposite side of the spout it would be PERFECT. My mom loved this gift. I didn't give it 5 stars because the material look and feel just didn't seem "exceptional" to me. But outside of that it's a great idea and she loves using it. Got my bowl last week and have been using it consistently to get a good feel and use of it. It is very sturdy, good size, and vibrant color. I really like the feel of it and how good it fits in my hand. I like how I can hold it with one hand pour all the water out without most foods not falling through.